We were recently given an insight into one business’ amazing result from using chatbots. Managing Director of Monaco Pro had used chatbots for the first time this year and put simply, Social Chatbot Marketing surpassed her wildest expectations. This one simple chatbot campaign had resulted in a 9 to 1 ROI. The main takeaway: a chatbot does not have to be complicated or expensive to be effective. No AI. No NLP. No multiple regressive conversational trees. All you need is a plain old understanding of your customer and a clear goal. Sounds deceivingly simple, but it’s true. Penny is not a tech whiz, and she did not have the experience of marketing with chatbots. She’s just a savvy businesswoman who knows her customers’ needs – and personality type. She envisioned how she would have a conversation with one, and wrote a bot script based on that. To make an impact with chatbots all you need is a strong brand voice that connects with your customers. It is that connection with your customer that makes your marketing effective. Not the latest technology, not the most exciting graphic. It’s the genuine connection. A well-scripted chatbot flow captures that connection and engages the customer – almost as well as you would yourself. And, sometimes, better. You can read Penny’s full post about her chatbot campaign success, including the exact numbers she got in her campaign, in our exclusive Social Chatbot Marketing group. 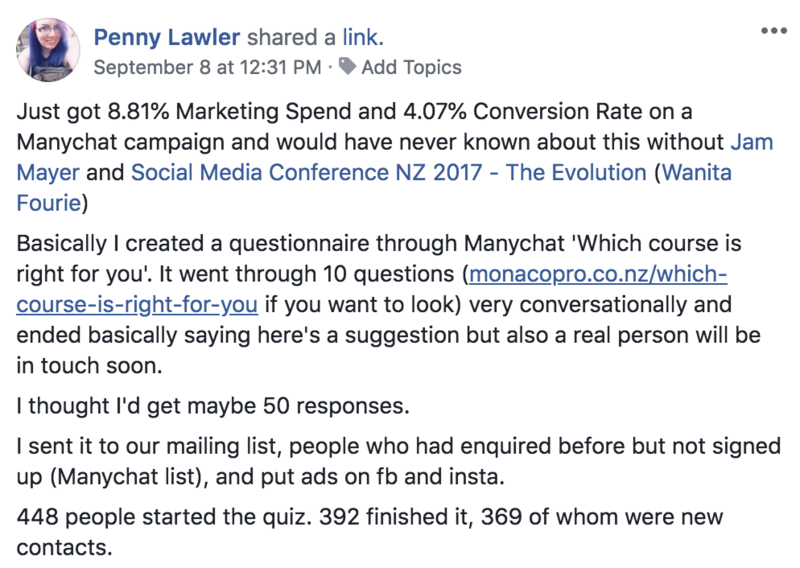 Penny credited Jam Mayer, our Chief Conversologist, for introducing and showing her the potential of chatbots when she spoke at last year’s New Zealand Social Media Conference. Penny runs a website dedicated to educating, upskilling and inspiring beauty professionals in New Zealand. She decided to give chatbots a try and created a simple chatbot that helps people to decide which course should they take. You can try it out for yourself here. The chatbot dialogue is very simple and very engaging. It’s only 10 questions long and offers a follow-up contact at the end. It feels almost like a casual enquiry chat with a real person. After setting up the chatbot, Penny advertised it to her mailing list, Facebook and Instagram. “I thought I’d get maybe 50 responses,” Penny said. What actually happened? According to Penny’s calculations, the return on her marketing spend was 9 to 1. A 900% ROI. How impressive is that? It’s no surprise to us that Penny’s experience with a chatbot was so positive. They are a natural progression in customer interaction, combining technology with the human touch for outstanding results in lead nurturing. Having addressed a wide audience at last year’s Social Media conference, our Chief Conversologist Jam Mayer is in demand as a champion of chatbots; but she will be more than happy to discuss one-on-one with you. Explore the potential for your own business; book a free chatbot consultation today.